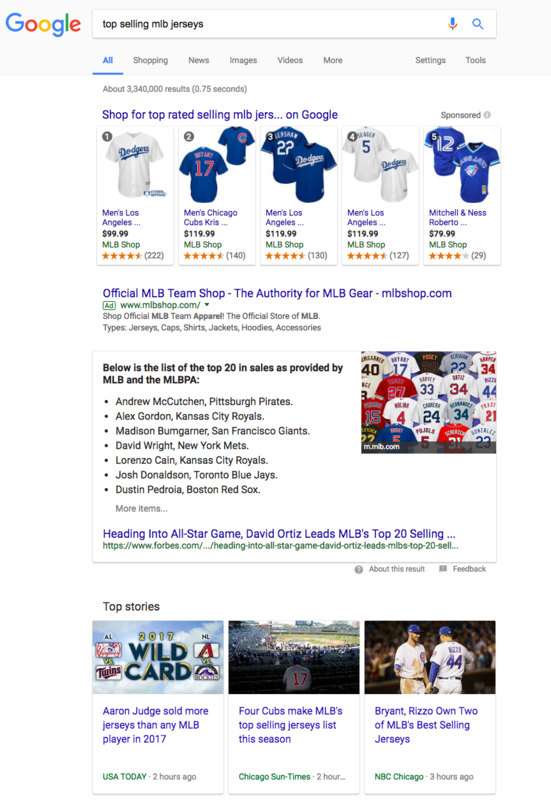 You would expect Google to give the right answer for the query: top selling mlb jerseys. Nope…! Garbage above the fold. Today, I spotted Google has started to label the ads in PLA’s at the top of the page. On a particular query, these labels can become misleading. Based on the news of the top-selling MLB jersey’s, which was the jersey for Aaron Judge, the New York Yankees rookie, you would expect this jersey to show up in the Google PLA’s. However, the rankings in PLA’s is not determined by the top-selling jersey numbers, but rather by how much the cpc a vendor is willing to spend on a click. The fact that Google is showing labels 1 to 5, is misleading for this particular search. Furthermore, Google is not helping the searcher with the displaying of an old Forbes article in position zero. The screenshot above is showing how Google is hoarding traffic to their own domains, and pushing the real organic results further down the page. Will we declare SEO is dead by the end of 2017? Google, you really can do better than this! It’s an impressive list, with a large number of these players still playing in the play-offs. The one player who seems out of place in the top 20, is Buster Posey. Although one of my favorite San Francisco Giants players, the team didn’t perform this year. Maybe they have a better shot next year, as it will be an even year again!